Releasing their self-titled EP earlier this year, Pottsville, Pennsylvania, band Crobot gave us a taste of their unique blues-based musical flavour. Now, just after a few short months, they have their major label debut album, Something Supernatural, ready for rock audiences to devour. Opening track, "Legend of the Spaceborne Killer", has its roots from Crobot's 2012 independent release of the same name, and a revamped version featuring the band's new rhythm section--bassist Jake Figueroa and drummer Paul Figueroa--was recorded for this year's EP. "Legend of the Spaceborne Killer" begins distorted riffs, almost like the band is warming up. It also contains some effects like a radio tuning in, reminding me of the futuristic dials and gadgets from the Enterprise on Star Trek. This song has a major early '70s blues rock feel, and Brandon Yeagley's vocals are heavily reminiscent of Jeff Keith from Tesla. While "Legend of the Spaceborne Killer" is heavy and '70s to the core, it definitely has a more space age vibe than a darker Black Sabbath one. "Nowhere to Hide" is the lead single from Something Supernatural. When I first heard it on the radio, I could have sworn Crobot was a new band fronted by Myles Kennedy of Alter Bridge and Slash's Conspirators. The similarities of Yeagley and Kennedy, particularly on this track, are uncanny. The guitar riffs on this one are funky, and guitarist Chris Bishop's solo is fantastic with its fuzzy effects. The chorus is catchy, and the whole thing is really upbeat for a song about someone being hanged. Crobot's upcoming single is "Night of the Sacrifice". It fits quite well with the band's supernatural and mystical themes. The chorus of, "Now you're gonna die / step right up / don't be shy," followed by the line "No one gets out alive!" is memorable. It has another impressive guitar solo, very much like "Nowhere to Hide". One shouldn't fail to mention "Chupacabra," with its twangy, country-inspired intro riffs and heavy bass. The Chupacabra may just be my favourite mysterious creature, as every time one is "sighted" it ends up looking like a creepy version of my Chinese Crested dog, Louie. (That's a whole other story though). The song "Chupacabra" is a great one, and the lyrics, "I found that bloodsucker down by the river," along with the repeated, "down by the river," really stand out. "Queen of the Light" is Something Supernatural's finale, and it sure is grand. It begins slowly, almost like a ballad. The vocals are strong, and Brandon Yeagley sings in his lower register to start. It features acoustic guitars in the beginning, but it goes electric for the chorus and beyond. It is theatrical, telling the story of a mysterious woman, "She has the keys to under Earth / her only wish a holy rebirth / all dressed in the darkness / but she'll trade it all for a white dress." It has some subtle distortion with the electric guitar, and it has the same space age feel of the album's opener "Legend of the Spaceborne Killer". "Queen of the Light" is darker than the rest of the album, and it's one of those great songs that is completely unexpected. I absolutely love this one, and it is my favourite along with "Nowhere to Hide" and "Chupacabra." 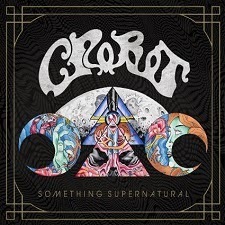 Crobot, with their major-label debut album Something Supernatural, has a phenomenal sound. I would say it's akin to the Black Crowes but definitely with a bit of a metal edge. (There just happens to be a killer metal scream in the song "Skull of Geronimo"). Their bluesy riffs, supernatural lyric themes, and hard-hitting vocals make Crobot a refreshing band in a sea of new hard rock acts who often sound too much alike.